I have become hooked on the QRP bug and have been slowly designing a portable QRP station. Logging was a bit of a problem, but I have been using a HandSpring Palm clone for a number of years and decided to have a go at writing a logging programme for the Palm Platform. 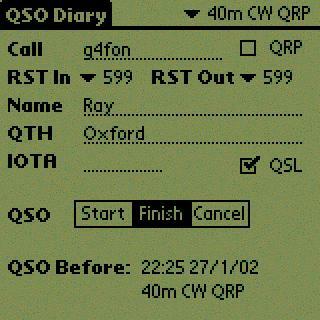 The result is QSO Diary which is a Freeware logging programme for the Palm Platform. Download it and give it a try - if you like it but have suggestions to make it better, send me an email and I will see what I can do to add in your suggestions. Alternately, if you hate it, drop me an email explaining why and I will see what I can do to make you love it. The download contains the Palm Application, a Windows viewer for the log files which can output the entries in ADIF format and an PDF file containing helpful information. Download the file into a temporary directory, run it to extract the install files and then run Setup.EXE to install the software. I did try a self installing executable, but I ran foul of the Microsoft Installer and would have had to add an extra 1.5 MBytes to the download to solve the problem! Version 1.5 released 1 February 2002 Fixes to issues with editting band information and a change to the time handling to allow the display of UTC on the Palm device. Thanks to Steve VE1SK and Bob N7XJ. 28 January 2002 to fix installer issues. Version 2.1 released 25 May 2002 - New QSO Notes feature and the ability to modify the QSO date and time. Support for older Palm devices which cannot display the Large Bold Font. Coming soon, radio management starting with the FT817.